Weston journey from battling CDH in the hospital to living everyday to the fullest. Life changes so quickly and you just have to sit back and watch. Weston amazes me everyday the things he accomplishes and the challenges he over comes. Weston has caught up so quickly with where his peers are it amazes me and he speaks so clearly. It will be a year in June since he had OT and so he has been doing all of this on his own and what I mean by this is that he is growing like a little boy. He is my adventure, he laughs in the face of danger and challenges it. Which of course scares his mommy to death, I just want to wrap him in a bubble. He loves music and loves to sing. I also loves seeing his letter 'W' for Weston, everywhere we see the letter 'W' he lets us know it. Weston also loves being a big brother to his new little brother Brenton. He is fascinated with Brenton's eyes and loves to poke them. Wow, time is just flying by! Almost Christmas, almost a new year and almost time for baby number 3 to make their appearance. We are having exciting times here, home school every morning, Quinton and Weston are soaking up so much information. Quinton is begging for school if I don't get school going by 9AM. I know the favorite activity is painting. Weston vocabulary is getting bigger everyday repeating everything we say, it is amazing me how much he is saying. He really loves music and does best learning by song, which is amazing since that is how I do a lot of my memorization. Weston loves watching Super Why and Word World and playing with his Thomas the train. I am doing good, 28 weeks and counting. Baby is very active and always letting me know when I've done too much. We can not wait to find out if its a girl or boy, of course waiting till they are born. Our plan is to do a VBAC, so far so good, whatever the Lord has planned as long as both me and baby are safe. I pray you all have a very merry Christmas and a blessed New Year!! Weston had a hearing screening test yesterday and did great! He passed and didn't have fluid on his ears yeah. We don't have to go back for 6 months we have been going every 3 just to make sure he didn't suffer any hearing loss from being on ECMO. So we go back in February. We are having many changes in the Rogers' house with two growing boys. Getting our house repaired from a hail storm that passed through Oklahoma in May. We are still waiting to get our windows replaced we had two broken out, which hopefully we'll have the new windows by the end of September beginning of October, yeah in Fall, could have used them during the summer months but oh well. We are also getting ready for another big adjustment in our house, we are expecting a baby the end of February. This will be our third and we are so excited. I am secretly hoping for a girl but a healthy baby will be the biggest blessing. We go and see the doctor today for my 13/14 week check up. We go and see the high risk doctor the end of September for our ultrasound just to make sure everything is ok. We are excited about going and seeing him and for him to meet Weston. 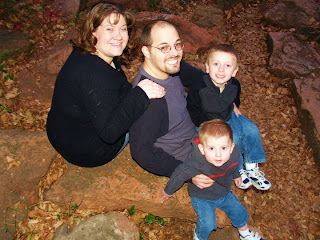 Another big change in our house is that I am going to start homeschooling Quinton(4) the beginning of September pre-k. I am really looking forward to teaching him and I know Weston will learn a lot too. Wow, I am horrible on updating Weston's blog and letting everyone know how we are doing. We are doing great!! I can't believe that we celebrated Weston's 2nd birthday almost a month ago. We learned that you do n't give him cards first because we never get to the presents. We gave him a Mickey Mouse clubhouse musical card and he did not want to put it down. We had a great time in Colorado/New Mexico with our families. We learned something every important that Weston starts struggling with his O2 stats at about 8,000ft, he drops down into the low 80's. We are so thankful that our parents had a friend close by that used oxygen so she had a portable pulse ox with her so we could check his stating. Something I need to purchase in the future whenever we take trips out of our elevation, just to monitor Weston and it was something I hadn't even thought of. So just an FYI to all other CDH families out there that look at Weston's story. When Weston turned 2 he hit the terrible 2's. He has been so rebellious. I mean he was before but now even more so, so stubborn. At the beginning of July we moved Weston into his toddler bed. He is really doing good, there are times he comes into our room and I take him right back to his bed and falls back to sleep. Two weeks ago Weston got released from therapy so we are specialist and thearpist free. It is so exciting, if you would have asked last year if this is where we would be I would have not imagined it. Of course Weston was still on his feeding tube and our GI doctor was telling us he needed a G-tube I praise God that we knew Weston could do it and he has. Slow and steady. We are so blessed. There are still nights when I lay him down to sleep I just sit there for a minute listening to him breath, it is such a wonderful sound. Last night we went and visited some of Weston's evening NICU nurses. It was so great to see them and for them to see Weston walking and saying "hi". As we drove to the hospital I started to get emotional and I told Timothy I didn't understand why. We have been up to the hospital so many times since Weston was discharged and it has never phased me. I think what it boils down to is that we were going at night when we would usually go up and see Weston. A flood of memories were coming back. It amazed me how your mind gets triggered by certain actions and it takes you back to a certain time. It was so emotional to see Gretchen, Ricki and Carla all of whom took care of Weston while he was on ECMO and for a majority of his stay. Gretchen was there when we first where able to give Weston a bottle. Carla got Weston moved out of the ECMO room when he was more stable. Ricki was always a big support in both rooms. 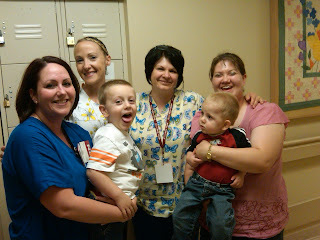 They were all such a big part of Weston's stay at Children's. We were all crying. They all mentioned did we know how blessed we were, I told them yes. They were so glad that we came up to visit so they could see how well Weston is doing. God is so good and continues to bless Weston with great health and a very healthy attitude. On Thursday we go for his last developmental evaluation. The hospital follows all babies who were in the NICU until they are two. I'll post after his appointment to let everyone know how he is doing. Weston is doing great and is picking up more words and saying more. His main word right now isWall-e, we watched that movie last week and he caught on to Wall-e and Eve. The other day we had the dogs inside to cool down and he walked over to the gate and looked over at the dogs and said " Hi doggie" we were laughing so hard. He loves singing Jesus loves me and bible bible God's best book. We are planning a trip the end of this month to New Mexico and Colorado we are going to the Red River encampment we are so excited. Time has sure gotten away from me especially since I last posted. Weston is growing by leaps and bounds and is into everything and is so healthy and amazing just to watch him walk around everywhere. He thinks everyone should know him and knows how special he is. This week has been busy and it is only Tuesday. On Monday we had Weston's hearing screening just to make sure he doesn't have any hearing loss especially since he was on ECMO it is a precaution we take until he is three. He has fluid in both ears, but passed his tested and the lady that did his hearing test was surprised that he did so well for having fluid on his ears. I was so proud of Weston, he sits so patiently waiting for the sounds, there were a few times that he was ready to get down and leave. After his hearing test we went to the NICU to see a couple of Weston's nurses when we were there, which has almost been two years, wow how time is flying. Both Darlene and Blake came out to se e Weston. Timothy was holding Weston and when Darlene saw us she thought Timothy was holding Quinton, she was so surprised that it was Weston. It was so great to see these two very special people and for them to see how well Weston is doing. Today we had another fun adventure, we went on a field trip with a group of our friends to PetSmart. We got to see and hold, a turtle, snake, kittens, lizard, rats(hairless and haired) and see a bird. It was so fun to see the boys different reactions to the different animals. Quinton is more leery of certain animals but more vocal. Weston touched all the animals and the only thing he didn't like was when they put the rat on his shoulder, he started crying. It was so much fun, to experience all these animals. Hairless rat on Weston's shirt. Quinton with a rat on his shoulder. Our God is an awesome God! You cannot say much else when you see His power in your life. Its hard for me to believe that Weston is going to be 21 months next Friday. Time is going by so fast! Weston is so independent and doesn't mind showing it especially if he doesn't get his way. He is a thinker, you can see the gears working when you ask him a question. He is a big helper he loves to sweep and vacuum. His newest trick is pushing buttons on and off. He thinks it is the funnest game ever. Last Sunday he walked to Bible class all by himself with his bible in hand. Last year we were just getting out of the hospital for the third time. Weston had caught RSV and the RSV was turning into pneumonia, as a parent you try to be strong but with the ER doctor is calling for the crash cart that is when you break. I was calling everyone we knew as we sat in the waiting room while the doctors worked on Weston. Praise God He prevailed and Weston was stabilized. He had a hospital stay of 5 days. As I look back I praise God for our experiences even though they were bad it really makes you appreciate what you have. I praise God that we have been hospital free for a year!! (knock on wood) We have had to give Weston breathing treatments but other than that he has been a healthy boy. He isn't in any isolation which is nice. Weston received his last RSV shot for the season. I thank God and his doctor that Weston had this extra protection for one more year to allow his lungs to get stronger. Of course Weston is excited he doesn't have to have a nurse come out to the house. He knows when they pull out the scale to weigh him what is happening it is so sad. One thing about Weston that amazes me he loves lifting up his shirt which reveals his scar, I know he is just being silly but seeing it everyday and a smiling face above it always makes me realize how blessed we are. Thank you all for following Weston's progress we are so blessed that so many people care and are praying for Weston's continued health. Don't forget to count your blessings and name them one by one because you'll be so amazed at what you have and what God has provided. Timothy and I have been married for seven years. Timothy is a computer programmer and I am blessed to be a stay at home mom. After four years of marriage we were blessed with our first son Quinton in June. Two years later we got pregnant again and were so excited, we went for our regular ultrasound to see how the baby was growing at 20 weeks, to find out that our baby boy was going to face one of the toughest birth defects, congenital diaphragmatic hernia (CDH). We had so many fears not knowing if he would even make it to term, but giving him every chance and not holding God back. This is his journey and ours. The majority of CDHs occur on the left side. The hole allows the contents of the abdomen (stomach, intestine, liver, spleen, and kidneys) to go up into the fetal chest. The herniation of these abdominal organs into the chest occupies that space and prevents the lungs from growing to normal size. The growth of both lungs can be affected. This is called pulmonary hypoplasia. 1 in 2,500 babies are born with CDH each year. It has a high mortality rate 50/50.